I got an email from Cari Corbet-Owen saying, “I recently completed producing a 2- part series on 1) why natural building is so imperative and 2) the challenges that stand in our way aka. building codes. I have posted them on youtube so that they are freely available and readily accessible. I’d love for them to be shared so they can help people. They feature voices like Mark Lakeman, Martin Hammer, Betty Seamen, Ianto Evans, Linda Smiley, Michael Smith and many others. 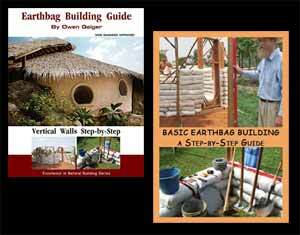 Natural building is a passion for me, so I have put a link to them from my website. I watched both of these documentaries and I can recommend them heartily. Add plaster mesh. Also, plaster will grab onto the recesses between bags. Use raschel mesh bags or tubes for optimum bonding (non-seismic zones only). If you can’t convince the building inspectors to be your friends, you could try applying the US’s latest bit of legal insanity. Say sincerely, in front of a judge, “Jesus Christ was a carpenter, and it is my deep religious belief that carpentry is a form of prayer. Therefore, building codes represent an undue burden on the practice of my sincerely held religious belief.” A similar argument can be based on the spirituality of working with raw earth and clay, or, if you’re willing to convert to Voodoo, welding as a form of prayer to Chango, loa of fire and metal. Of course, if you’re on this blog, chances are you don’t have the million dollar lawyers to make this kind of argument stick, but maybe you’ll get lucky and find a judge who’d feel bound by the letter of an absurd law. That made me laugh. All this to get ‘justice’ from our public servants.